A perennial shrub that forms a large underground root system Erythrina acanthocarpa is commonly caller the Tambooki Thorn. Grown for the very attractive flowers it is not common in cultivation. This is a plant from South Africa, in particular Tambukiland which is now known as Queenstown, in the Eastern Cape area. Requiring full sun and an open position to thrive the flowers appear in late spring to early summer. The flowers themselves are orange to red with yellow and are followed by spiny seedpods. Best suited to a dry garden planted with other low water requirement plants. This is a deciduous shrub and can be lightly pruned to maintain a better shape. 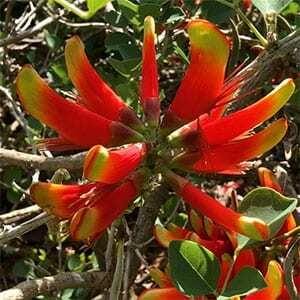 You could also grow Erythrina acanthocarpa in a large container in a very sunny courtyard. This is a plant that requires a permeant position in full sun. The root system is extensive and it will out compete other plants. In terms of size, it will reach around 1 – 2 metres in height and spread to around 1 metre. Good drainage is essential and overwatering or wet soils will quickly kill the plant. A little organic fertiliser such as aged cow manure each spring will be beneficial. Seeds are available for sale from some online seed merchants.